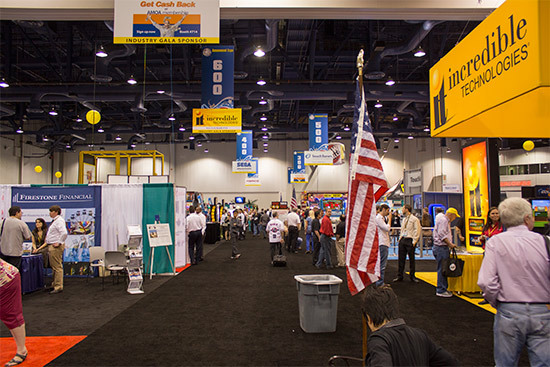 Location: Las Vegas Convention Center, 3150 Paradise Road, Las Vegas, NV 89109, USA. 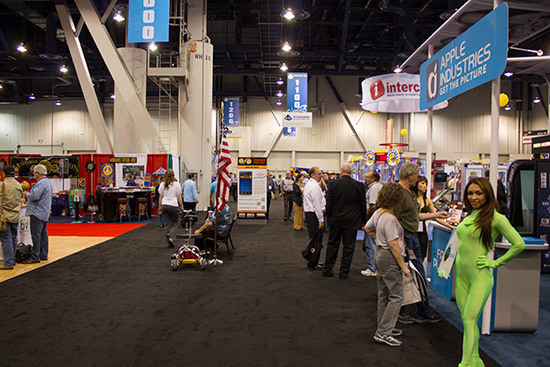 We're back at the Las Vegas Convention Center for the show officially called Amusement Expo but still referred to in the trade as the AMOA show, after the Amusements and Music Operators Association who co-sponsor the event. Expectations were high when the smell of freshly-cooked food filled the corridors leading to the hall, but this turned out to be coming from the nearby International Pizza Expo. With the Nightclub and Bar Show also being held in the same complex, everything you needed was right here in one place. 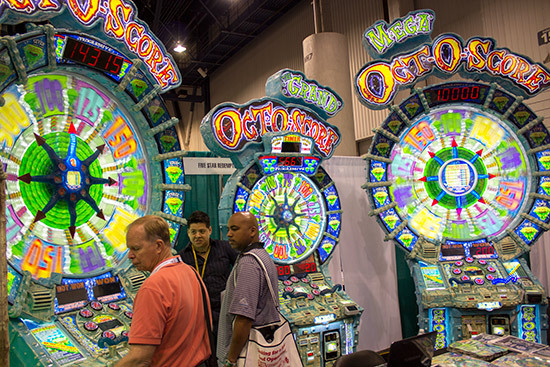 The Amusement Expo show was held in hall N1 and featured most of the major coin-op manufacturers. 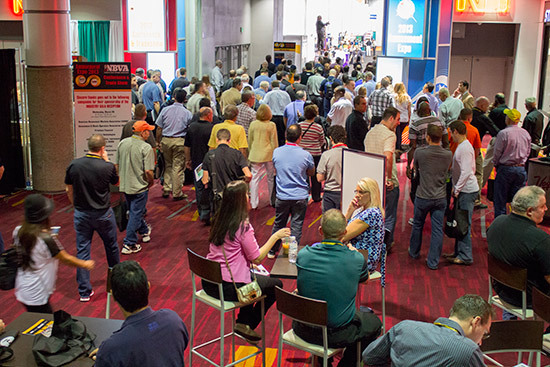 The doors opened at midday on Wednesday when the trade-only attendees were allowed in. Inside, the show was around the same size as in previous years, with few empty exhibitor spaces, a good number of visitors and plenty of eye-candy. 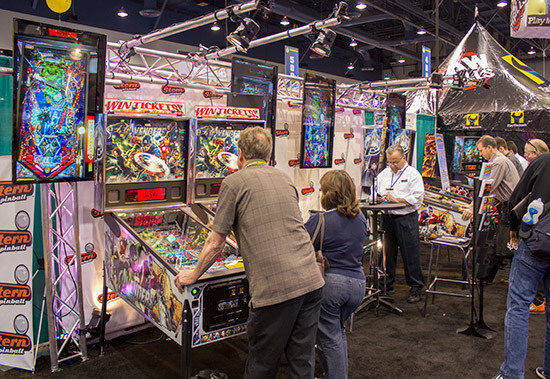 On the pinball front, both Stern Pinball and Jersey Jack Pinball were exhibiting. 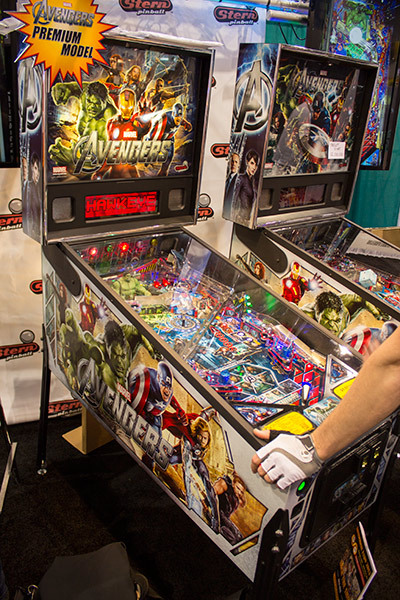 Stern had a stand with a little help from Marco Specialties, featuring six machines - four The Avengers of various flavours, one X-Men Pro and one Avatar. Gary Stern was there, proudly showing off the AAMA Manufacturer of the Year award won by the company after being nominated by their distributors. Two of The Avengers machines had ticket dispensers installed to show their redemption capabilities. 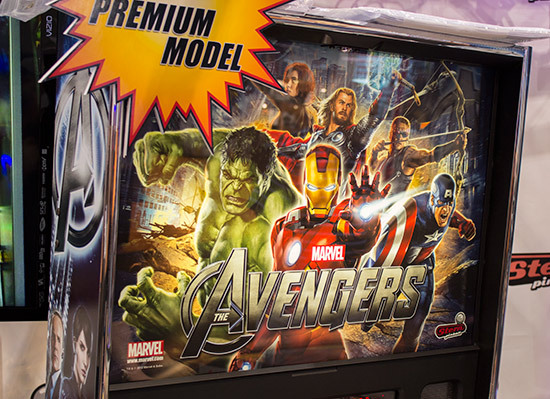 Next to these, Stern's latest version of The Avengers was on display - the Premium, which is essentially a Limited Edition playfield in a Pro cabinet. There are some cabinet wiring changes compared to the Pro, and the Premium has its own unique translite. 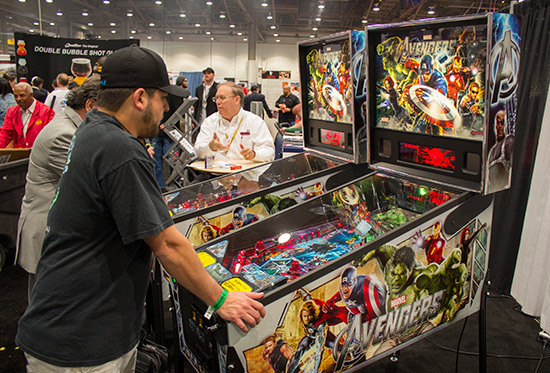 Josh and Zach Sharpe were running an IFPA PinGolf tournament on three of the machines - The Avengers, X-Men and Avatar - where competitors had to reach the target score of 12M in the fewest balls possible. The tournament ran through Wednesday and Thursday with a single $10 entry, and at the time of writing is still under way. 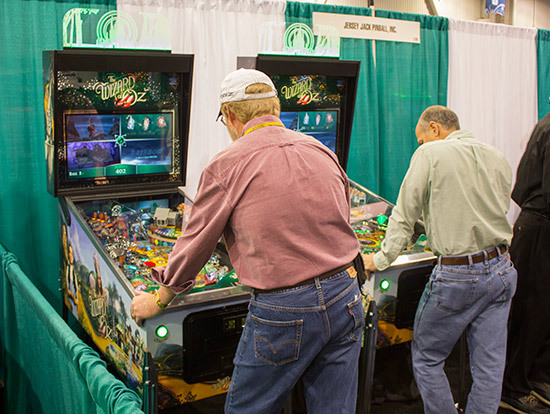 Elsewhere in the hall, Jersey Jack Pinball were exhibiting two The Wizard of Oz machines on their stand. 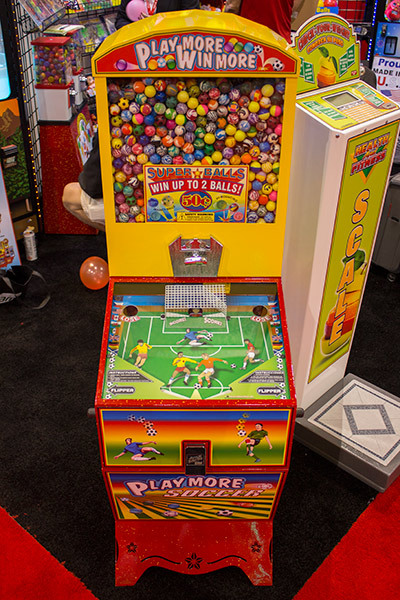 The games had slightly newer software than the version seen at the Texas Pinball festival a couple of days earlier, preventing players from stealing locked balls and starting multiball in multi-player games. 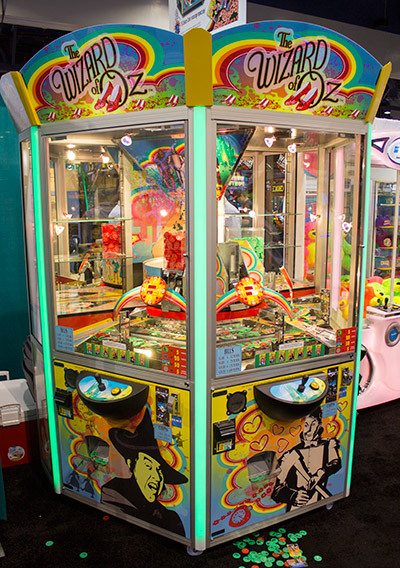 Also on the Jersey Jack Pinball stand were two games manufactured for Pinball Sales. Blocky is a scaled up reworking of an iPad game which uses a large touchscreen monitor to allow players to identify rectangles with the same coloured blocks in all four corners. Ticket Racer is a young kids redemption game still in development, where a race car spins round a circular track until the player presses the brake pedal to stop it on a number. The game then dispenses that number of tickets. 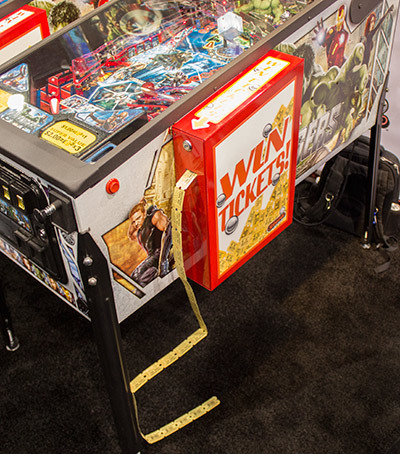 Stern and JJP were the only exhibitors of actual pinball machines, so here are a few other products which caught our eye. 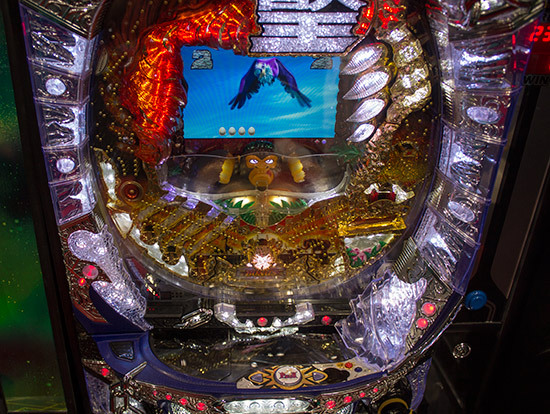 This Eastern Pinball game initially got our excitement levels up. 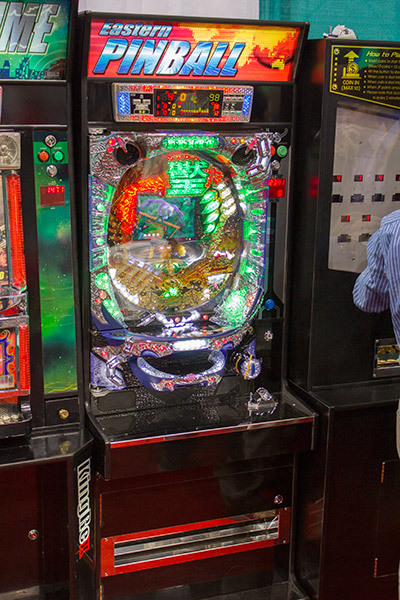 That was until we realised it was just a fairly standard pachinko machine, with the twist that all the balls are enclosed within the machine. It had nothing to do with pinball, but it did look very pretty. This next product did have something to do with pinball, although not all that much. 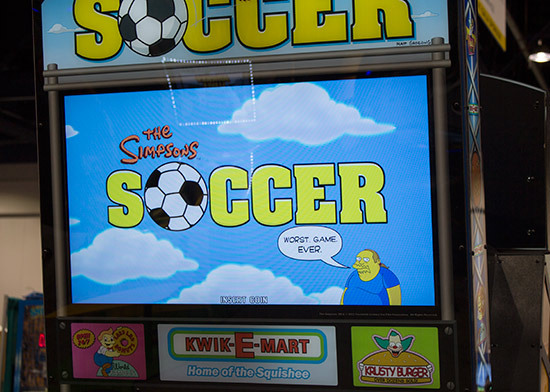 Keeping with the football/soccer theme, this company were sending out mixed messages with their The Simpsons Soccer game. This balloon bursting game was strangely addictive - as long as it was on free play, at least. 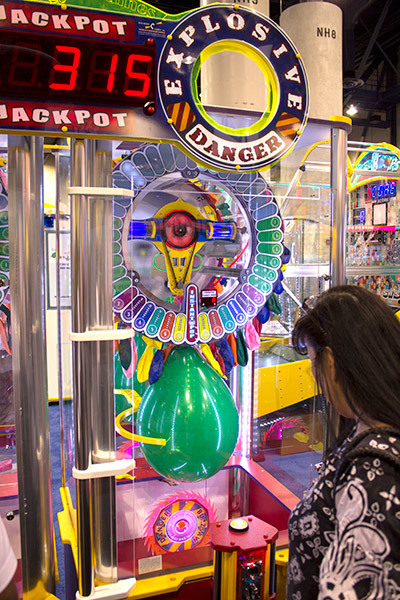 Players stopped the spinning light to set the number of times the pump at the top of the machine inflated the balloon. When the balloon expanded too far it wound hit the rotating tiger-saw blade at the bottom of the cabinet and pop. The balloon game was a fairly large piece, but paled in comparison with some of the other exhibits in the hall. In his seminar talks, Jack Guarnieri has mentioned the pusher themed on The Wizard of Oz, and there was one at the show for anyone not already familiar with it. 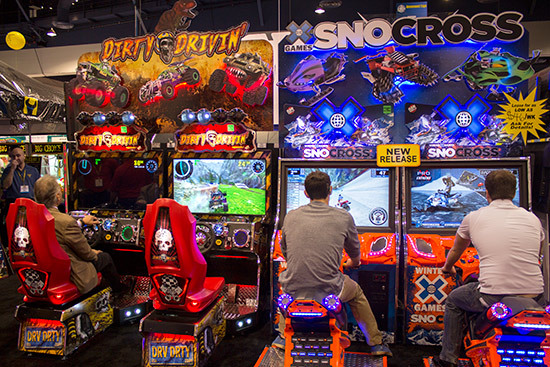 Next to Stern's stand, Eugene Jarvis's company Raw Thrills were showing the power of the topper with their two latest racing games; Dirty Drivin' and SnoCross. Now it's your chance to look around Amusement Expo 2013 with our exclusive Seven Minute Tour, as we walk down the aisles showing you the stands, the products and the people. 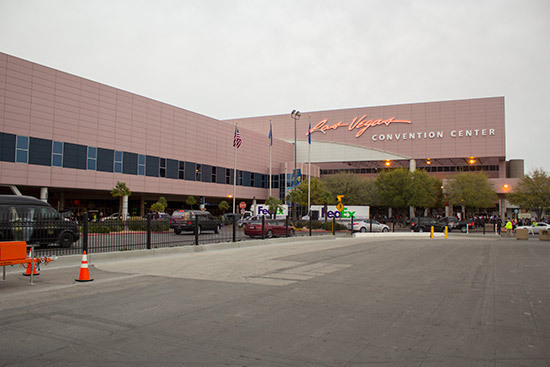 Finally, we mentioned earlier how the Nightclub and Bar Show was also taking place at the Las Vegas Convention Center. As though we needed an excuse to visit and enjoy the many free samples of beers, spirits and cocktails, as luck would have it Stern Pinball also had a stand there. Entry to the Nightclub and Bar show is by a separate ticket and again restricted to trade visitors. It is in a much larger hall and receives around ten times the number of visitors to Amusement Expo. The two The Avengers Pro machines there received plenty of attention, despite the number of other interesting views and distractions all around, with Stern staff taking turns to come over from Amusement Expo to man the stand. 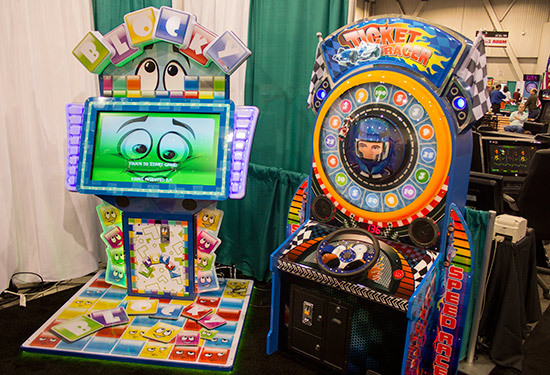 That's all from this years Amusement Expo. 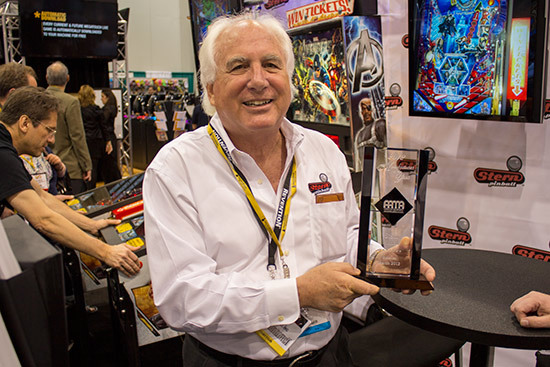 We hope you enjoyed it and we'll be back with our next Pinball News show report very soon.